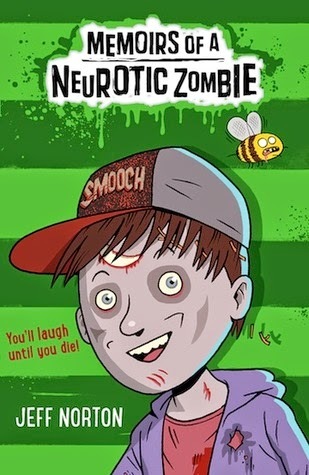 I first heard about Memoirs of A Neurotic Zombie by Jeff Norton at a blogger event earlier this year and Jeff Norton was there to read some of the beginning of this book aloud ... and it was hilarious. I found myself laughing a lot listening to this funny, awkward, neurotic pre-teen turned zombie and his adventures and I knew that I was going to love it. And I did. Adam Meltzer has the shock of his life when a few months after he dies from a bee sting at his 12th birthday, he wakes up as a zombie. This is his story of how he both adjusts to zombie-hood but also how he solves the mystery of his own death/why he turned into a zombie. It was a whole lot of fun and is populated with some great supporting characters. I especially loved the idea that everyone is different and that those differences should be celebrated. The thing with Adam Meltzer is that he's many things. He's obviously a pre-teen and now a zombie, but he's also a germaphobe and an absolute worrier and those things can offer their own sorts of humour. But I think the thing that I love most about Adam Meltzer is how literal he is. I know an almost 9 year old who is just as literal as Adam and I could really understand and relate to some things Adam seems to question throughout this book. Together with Adam in this detective mission for answers are two friends Ernesto and Corina who are in the unique position to understand Adam's predicament in that they are a chupacabra and a vampire respectively. What I really loved about this trio is the level of support and friendship they give to each other. Altogether, Memoirs of a Neurotic Zombie was a really fun, funny book about a group of outsiders who find a place to belong and who go on this dangerous adventure seeking truth in this really entertaining way and I was gripped throughout by what they get up to. I loved reading a book that was so humorous as well as being full of heart. Highly recommended!